Struggling phone maker Research in Motion announced today a new budget level smartphone, the BlackBerry Curve 9320, aimed at first time smartphone owners as well as those looking to upgrade from older curve models, like the highly popular BlackBerry 8520 among the youth of today. 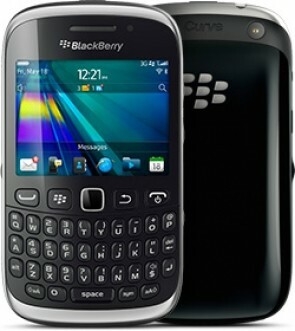 It's essentially a BlackBerry 9220 with 3G connectivity, featuring the same 2.44" non-touchscreen display with a resolution of 320x240 pixels, an improved 3.2MP rear camera with flash and the same curved full qwerty keyboard design. There is also a dedicated BlackBerry Messenger button and it runs BlackBerry OS 7.1. Helping move along that OS is a single-core 806MHz processor, 512MB ROM, 512MB RAM and a 1450mAH battery, which RIM claim is good for seven hours of talk time or 18 days in standby. Connectivity is provided by HSDPA and WiFi , and also includes GPS and a pre-installed FM radio. Storage is expandable up to 32GB via microSD. It is clear the Canadian firm has aimed this phone at the lower end of the consumer market in the hopes of continuing the success of their BlackBerry 8520: "The new BlackBerry Curve 9320 is designed to make it incredibly easy for users to stay socially-connected," said RIM's executive VP of smartphone sales said in a statement. "The new BlackBerry Curve 9320 will be especially popular with customers upgrading to a smartphone for the first time and existing Curve customers looking for a step up in speed and functionality." The new model will be available in the UK from May 14, with further releases in other countries including India due next month. RIM has not published prices yet, but UK operator Three has revealed it will be charging £139.99 on pay as you go. Those on contract can grab it for free from £15 per month.